Major League Baseball Hall of Famer Yogi Berra once said, “The future ain't what it used to be." Although he used the saying in the 1970s, the popular quote also aptly describes the state of our workforce today—especially now that every millennial is old enough to work. For the first time, the millennial generation, or those born between 1980 and 1996, will dominate the workforce this year based on their size alone, eclipsing the Baby Boomers and Generation X. As a result, every aspect of the traditional working world will be turned upside down—from employee retention, benefits, recruiting strategies, to office culture and beyond. Despite a plethora of millennial-focused musings in the HR industry, managers are still scrambling to understand the unique ideology they bring to the workplace. 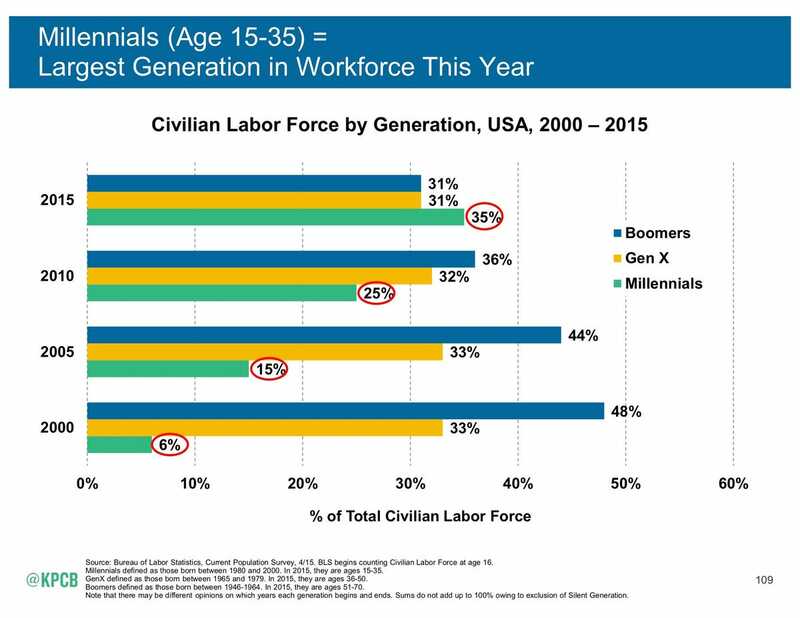 1) Millennials make up the majority of workers, starting this year. For many employers, the millennial “doomsday" has arrived. They now make up 35 percent of the workforce. With both Baby Boomers and Gen X holding down about 31 percent each, that officially makes the millennial generation a force to be reckoned with—compare that to just five years ago when the millennials made up only 25 percent of the workforce, and 10 years ago at only 15 percent. That's a problem for companies who are still trying to figure out how to attract, manage and retain a younger generation with very different work values than the Baby Boomer, the generation that re-wrote other workforce rules half a century ago. 2) Millennials bring different skills to and want more transparency from their jobs than older workers. How do hiring managers see millennials? Well, the good news is they are seen as more adaptable, creative, open to change and entrepreneurial compared to Gen X. But 80 percent of hiring managers also view them as narcissistic and 65 percent view them as more money-driven than their predecessors. But compare that to what millennials say they want: exciting work, a good mentor and enjoyable coworkers. Managers who want to retain their millenial employees must appeal to their needs for transparency, regular feedback and fairness. 3) Millennials have fostered a new freelance-driven economy. Millennials' unique workplace skills and desires have led to the "gig economy". A recent study shows that 69 percent of millennials would prefer to freelance if they could find enough projects to earn the salary they are worth and 79 percent would quit their regular job and work for themselves. But millennials are not alone—many workers from all generations feel the same way. Over one-third of the workforce today is considered a freelance employee, independent contractor or temporary worker. 4) Millennials value learning when employed full-time. Attracting qualified and skilled millennials is difficult enough. Retaining them is even harder. What do millennials value most? Training is crucial—according to a study from Mindflash, 32 percent of millennials say their company lacks adequate training, so they seek out opportunities for themselves. Flexible working hours and cash bonuses rank high as well. Traditional benefits that motivated the Baby Boomer generation such as more vacation pay, a company car, maternity benefits and travel reimbursement are much less important to the younger population. 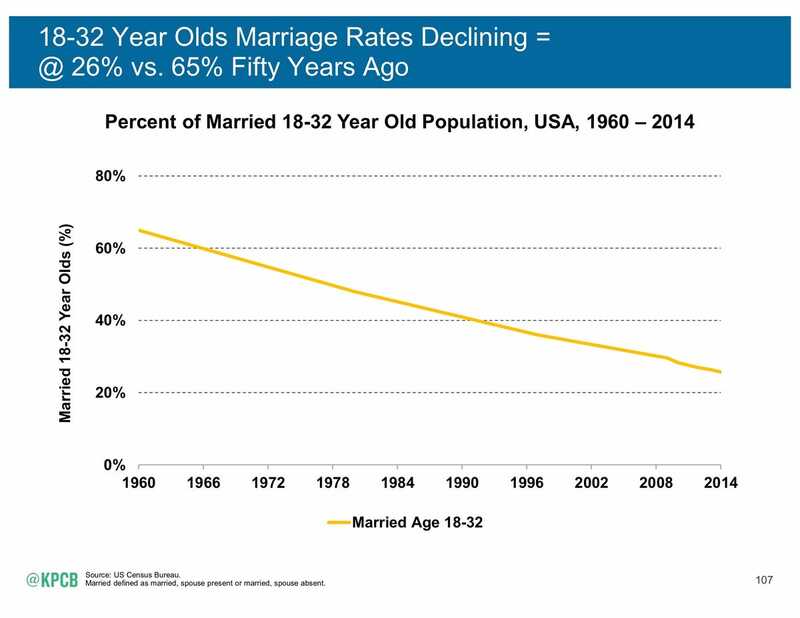 5) Fewer people under 30 are getting married, which means more mobility. Expectations around marriage are changing. In 1960, more than 6 out of every 10 people under 32 years old were married. Fifty years later, the percentage of married people under 32 is less than 30 percent, and falling. With no spouse and often no kids (and no home), millennials are more mobile. They have fewer traditional obligations that used to keep workers from quitting their jobs like families, mortgages and car payments. Those barriers are gone, and with it the ties that kept employees working for the same employer for extended periods. With the lines between work and life blurring, it's worth examining both societal changes at home and in the office to fully understand this generation. "Millennial" can no longer just be a buzzword thrown around the room like a hot potato—it's time for HR leaders to embrace the new workforce majority, and as a result, embrace the new world of work.